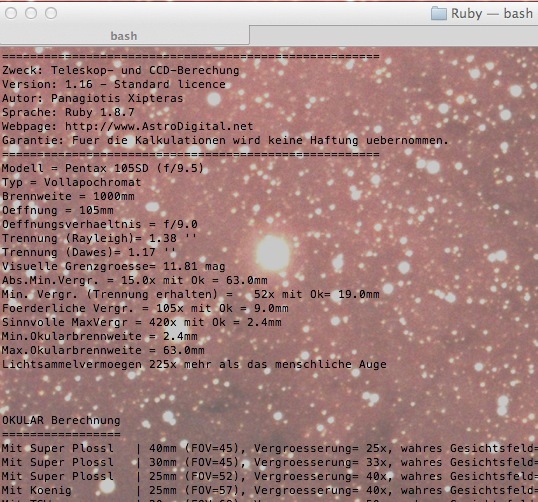 A Ruby implementation for astrophotographic and visual calculations. It runs direct on the command line. Neither user interface nor graphics support are available. If you want more comfort and much more features get the free .NET version! "AstroDigital.Net for Ruby“ is freeware and it is distributed as a single, free-of-charge ZIP package. - Enter „Ruby -v" to detect if Ruby is already installed on your computer. If not, download the perl package and install it. - Enter " Ruby AstroDigital.Net.rb „ to run the program. - If your telescope is not included, you can easily configure it in the script using a text editor.